All brides (and some grooms too!) want to come up with creative wedding favors for their guests. 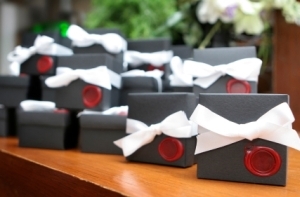 Some couples choose to go with a more general favor such as a personalized mint tin or a wedding wine label. Others go for a more personal theme, for example a CD featuring favorite/memorable songs of the couple, or a small bottle of spices indicative of the couple's love for cooking. Even others will use the wedding theme as the basis for the favor such as beach wedding favors, or Christmas wedding favors. You should make the decision based on the amount of time you have to create the favors, as well as the portion of your wedding budget put aside for this task. Of course, the other main decision is whether or not you will make your favors or buy them. Personal favors usually are homemade while general favors can be bought. Finally, it's important to remember that the wedding guests are not the only group who receive favors. The bridal party and the groomsmen earn their own set! We're also going to give you some great ideas for wedding shower favors and engagement party favors. After all, these events are wedding-related! For all events related to the BIG DAY! Anytime you ask family and friends to gather in celebration of your wedding, they are going to bring a gift. You should return the favor (no pun intended!). The brides aren't usually involved in this decision, so this is for you sisters, mothers, and best gal pals! For Bridesmaids and Groomsmen alike. The favors for the big day. These can be handmade, store bought, or a combination of both. If you are having a fall wedding, you may want to theme your favors on the colors and sights of the season! Edible favors are always a popular treat. These days, cupcake wedding favors are in! Find examples of how your creative wedding favors could be cupcakes! Return from Creative Wedding Favors to Home. Visit Designed by the Bride! Jamaican-themed wedding? 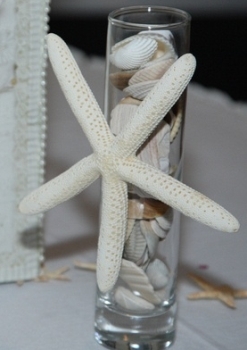 Visit Jamaica Beach Weddings for a multitude of ideas!